In Refugee-Resettlement Debate, Former Marine Wants To Put Translators First After troops returned home from Afghanistan, many translators who worked with them became targets and were forced to flee. 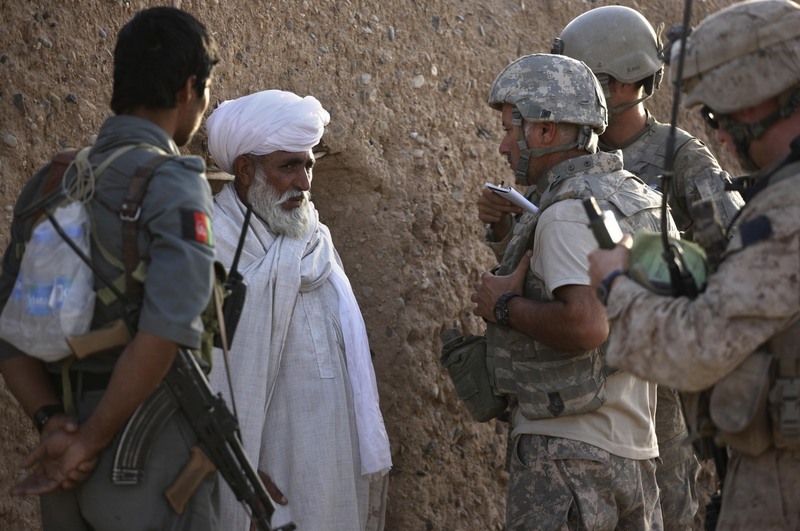 A former Marine is now trying to help his former translator get to the U.S.
Afghan-American translator Waheed Kazenpoor translates for U.S. forces as they speak with a local during a Afghan-U.S. patrol in an area frequented by Taliban militants in southern Afghanistan on Sept. 28, 2009. When U.S. soldiers and Marines returned from Iraq and Afghanistan, many left behind local translators who they'd worked closely with. These people often became the target of reprisals and death threats, forcing them to flee their own country. For the past few months, Aaron Fleming, a former Marine sergeant, has been trying to help his former translator, Sami Khazikani, make it to the U.S. after he had to leave Afghanistan. Khazikani's now stuck in limbo in Germany waiting to hear if he'll be given asylum in Europe, get a visa to the U.S., or be sent back to Afghanistan. "I certainly looked at Sami not only as a key element to our success, operationally speaking, but as a very dear friend," Fleming says, "and whether or not he ever earned the title of Marine, in my mind, he certainly did with us on the battlefield." Khazikani says he knew at the time that he was signing up for a risky job. "I wanted to help my country as well as help with the coalition forces because I could speak English," he says. "I knew the consequences but I [didn't] care about it really. But now I only live for my wife and for my child." It was risky not only because he was working with the U.S. military in a war, but it was also because he might be seen as a traitor by some in his own community. That's exactly what happened and he and his wife were forced to flee, first to Turkey and then to Greece. That's when he got in touch with his old friend. Most of our interpreters over there, himself included, try to keep their employment history with the coalition forces a secret, you know, for personal safety reasons. And Sami had taken some leave to go home and check up with his fiancé and attend a wedding. At the wedding, a fellow Afghani army soldier, one who had actually been in the unit that we were attached to, recognized Sami, he was also a guest in attendance. He made it no secret exactly who Sami was and what his role was with the coalition forces, which you know, caused quite a bit of an issue up there with his fiancé's family. His fiancé's family had contacted the village elders to determine what should we do with the situation here. As it turned out, the village elders were closely tied in with the Taliban in that region, so they brought it up to the Taliban. So they came up with the solution to it which was if they could find Sami they were going to execute him. So he and — Yasmiin, then his fiancé, now his wife – got married in secret at a relative's house and the very next day fled Afghanistan to Turkey ... After about a year of living in Turkey, the Turkish government sent their immigration consulate by and essentially said to all the refugees there, Turkish government cannot support the burden on the economy of hosting you anymore so you need to go, but we're going to put you on a boat to Greece. I believe they do. I believe that Sami served the U.S. government faithfully and honorably and very proficiently. And I really genuinely believe that it's time our U.S. government pays Sami back for the time that Sami has served working for us. To me this is not an immigration problem. This is a refugee problem. And the interpreters who are hired to work for coalition forces go through a very thorough vetting process to ensure continuity in their veracity. And a lot of the background work with these guys has already been completed, it's already done. If anything, we should not be discussing necessarily the topic about how many Syrian refugees are we going to be taking in, we should be taking a look at those interpreters who are now on refugee status, who have served our government honorably. We should be taking a look at them ahead of anybody else.